On Wednesday we planted our garden. We keep thinking this might be a risky move considering the weather we have been having this spring in Wisconsin. Just in case we get frost - I have sheets ready to cover everything if need be. We do not have a large garden - more like a hobby garden. Our garden is only 8 feet by 24 ft. - the garden runs the south side of our garage. Something to grow and care for during the summer months. We grow tomatoes, yellow pepper, green beans, okra, yellow squash, cucumbers, onions and garlic. Our plan this year is to grow our garlic, then dehydrate it and grind the dehydrated garlic. I will let you know how that goes. I plant sunflower seeds for the birds along the garage and marigolds to keep out the rabbits. My hubby made the neatest things for the cucumbers and yellow squash. Check out the pic....super easy to make. 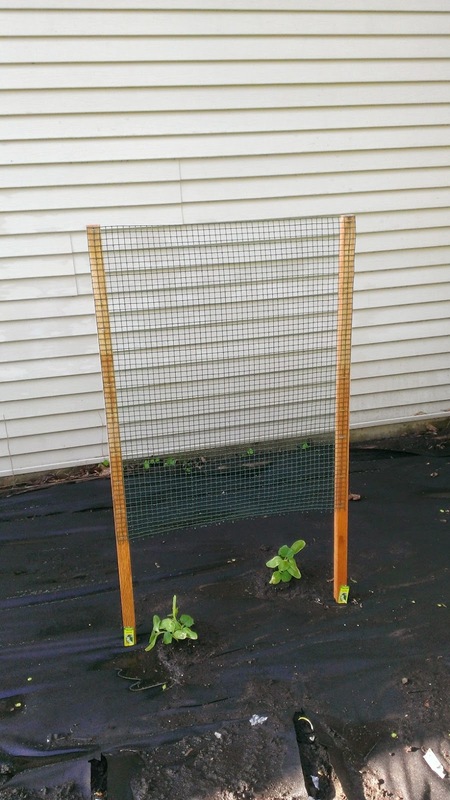 All you need is wire fencing that has been plastic coated, 4 poles, and a staple gun. Cut fencing then staple to the poles. Hammer in the ground so that they are sturdy. If need be we can tie string connecting each pole for more growing area for the vines. We use mess in our garden to control weeds a biodegradable mess that is perfect for stopping weeds. Picking weeds is not a favorite of mind! The mess works great at preventing weeds and is perfect for a small garden like ours. Now to get watering and hopefully everything grows. My hubby is the garden waterer and also the feeder of the garden. He has his own concoction of nutrients he puts on the garden. Designed for the plants we grow. Do you have a garden? If so, what is your favorite veggie to grow? We don't have a garden, but I am a frequent shopper at my local Farmer's Market! Good luck with your garden.We have a small section of our garden separated for fruit and veg. My favorite that we grow would have to be our cherry tomatoes i eat them all day everyday :-). I am thinking of starting one, I would love to grow tomatoes, carrots and cucumbers! I'm growing basil right now and that's about it. I'm totally loving it though. One day I want to have a huge garden! Frost? Wow.. that is crazy in spring.. speaking from someone from TX. My husband is also the garden hand.. He plants, feeds, waters and tends... Our garden veggies/ fruits are in pots that are on our patio deck table and covered by a large mesh wooden box built by my husband. Gotta keep the critters away! That is a nice size garden. Plenty of room for fresh grown goodies. How exciting!! I can't wait to be able to plant a garden. Good luck to you!! No garden here. One of these years we'll get to it- I love having fresh veggies on hand. Onions grow like wildfire in our garden. I actually need to start replanting again soon. We had a garden, but we weren't good at it. We were really good at growing basil last year, though! I need to have a gardening day. I just threw some cilantro in my raised planter the other day and Im so excited to see my cilantro sprouts! Congrats on getting your garden planted. We just planted ours a few weeks ago. I think I have a few ripe tomatoes that I'm ready to go harvest. We do not have a veggie garden. We are currently working on a herb garden. My favorite is the CHOCOLATE mint! It smells amazing and repels mosquitos! We have not been able to have a garden since we moved 2 years ago and I miss it so much!! I'ts not only a money saver but I love watering it every time...it's my "alone" time! Good luck! I miss having a garden. We have a garden and love it. It is work but so worth it with the children. WE do have a garden. I love to grow squash and lettuce. This reminded me to water my plants, haha I actually went and watered them before I commented so thanks ;) I have a balcony garden of herbs and a few flowers and I love it! We had a full garden two different times and both failed miserably. Our fault, completely. So now we stick to small container gardens in the yard. I'm seeing a lot of talk about gardens. I need to grow! This year we only planted nonGMO corn and I always have mint and blackberries. I want to do tomatoes, bell peppers, and herbs next year, with a few heads of lettuce and some squash. I wish I could make one grow! Everything dies in the Florida sun! We don't have a garden. We have done tomatoes in topsy turvy's two years in a row and been very happy. That's a nice size garden! I'm curious to hear how the garlic comes out, I love the idea! Good luck with your garden! I have yet to grow my own veggies, but it's something I really want to try. I really like to plant and grow things with my children. Our favorite plant to grow last year were potatoes. They grew so easily and we had a HUGE yield! We're scared to get one more frost here too. Crazy to be worried about it so far along in the year, but we are for sure. This year we just have herbs but I love planting tomatoes and the kids love watching them grow! I have herbs planted in containers. We live in the city and have no dirt to plant. I don't have a garden. I keep saying I'm going to start one. I need to get on it. I want to grow tomatoes, strawberries and herbs! I have just a little hobby garden too but I elate in getting fresh produce from it. There is something very satisifying about growing your own stuff. I don't not have a garden. I don't have a very green thumb and all plants seem to die in my care. I love gardening. Our soil is awful so we have a hard time getting anything to actually grow. I love gardening and this time of year is my absolute favorite because of all of the fresh veggies!